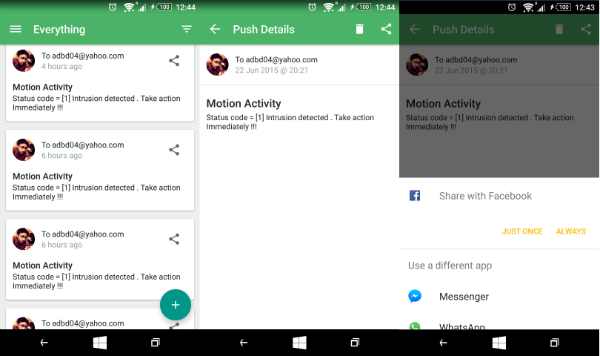 Create a motion-activated Pushbullet Notification to your smartphone. MotionSense is a motion activated Pushbullet notification system for your smart and handheld gadgets. It detects activity and notify you to take action. It consists of an Arduino with WiFi connectivity and one PIR sensor to detect activity. ESP8266 has power issue. At the time of data transmission, it draws power from arduino so much that arduino may restart if Arduino is powered via PC USB. Even with 5v power supply through power plug may not suffice. Hence it is always recommended to use external power supply for ESP8266. However in my experiment I used a quick & cheap solution for this. I used one 1000µF electrolyte capacitor to supply enough power to ESP8266. Create Account in Pushbullet. Get Access Token in Account Section. In API section you can see different APIs for different purposes. NOTE : Here all the API link and URLs are provided for https connection and Arduino can not use https as it is not that powerful to handle that. Hence we will use HTTP version of those APIs which is not mentioned here in pushbullet docs but I got this reference from github. In pushbullet docs for pushing they had mentioned URL which is HTTPS, so we will use HTTP URL and port provided in that github project. Also we will add /pushbullet before and REST path they had mentioned. Now you need to put logic on Arduino. Go to Experiments folder. There you will find MotionSense.ino, your code which will push notification to your Smart Devices. Copy this code to arduino IDE and connect your arduino ( already set up with WiFi and PIR sensor ). Also use your access token as mentioned in above snippet. It will take time for sensor calibration, WiFi module initialization and for connecting to your access point. You can see these things in your Serial monitor. "Everything fine | No intrusion "
in your serial monitor continuously. Whenever you go go in-front of your PIR sensor, it will detect movement and Push notification to your devices. Published at DZone with permission of Anupam Datta . See the original article here.